As a social media manager, understanding how to leverage Facebook Ads for your marketing strategy is essential. Facebook Ads can transform your business’s social reach without hurting your budget. In this guide we’ll share with you everything you need to know about advertising on Facebook—from setting up a campaign to tracking results. Facebook advertising allows businesses to promote custom ads or content targeting a specific audience, with costs varying based on the reach and engagement the ad receives. Facebook ads can appear in your target audience’s News Feed or right column of Facebook. When you advertise on Facebook, you’ll gain insight about your current and potential customers. The data you collect through Facebook ads allows you to improve your ad targeting for a more efficient and effective advertising experience. Always determine your objectives before you start. It’s important to know the purpose of your Facebook Ad before you decide on a budget for advertisements. Understand whether the aim is to increase for brand awareness, conversions, video views, etc. Each action made by your audience on your Facebook ad costs money, so make sure you solidify your objectives before making those investments. Be specific on your audience targeting. Facebook houses millions, if not billions, of data points. Take the time to narrow your audience targeting to ensure your ad will appear where the people you want to see it will be. Rotate your ads regularly. 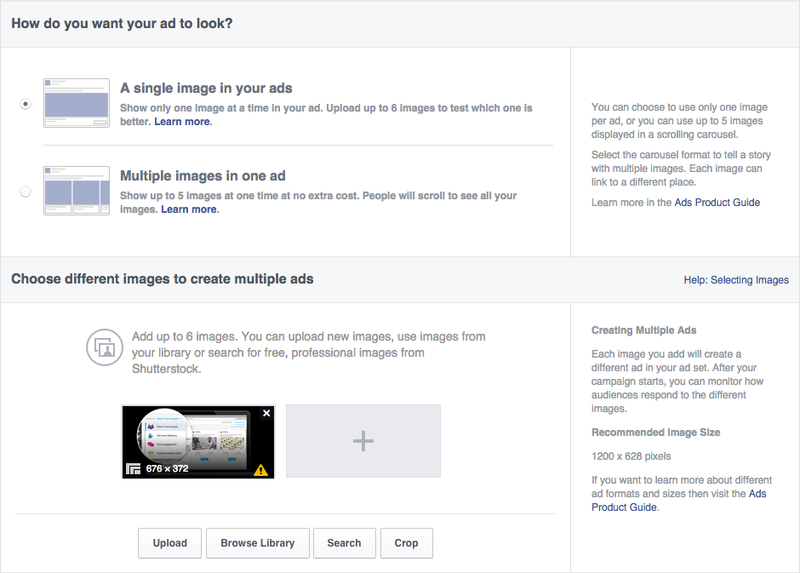 To avoid ad fatigue, rotate your Facebook ads regularly. ‘Ad fatigue’ is when people see your ad too many times, so they get bored and stop clicking. Unfortunately, when your clickthrough rate starts to drop, Facebook penalizes you, driving up your cost per click (CPC)—which makes likes, comments, and clickthroughs more expensive. This affects both acquisition and engagement campaigns. With these seven steps, you’ll be able to define your objective, target an audience, set a budget, and place your ad. 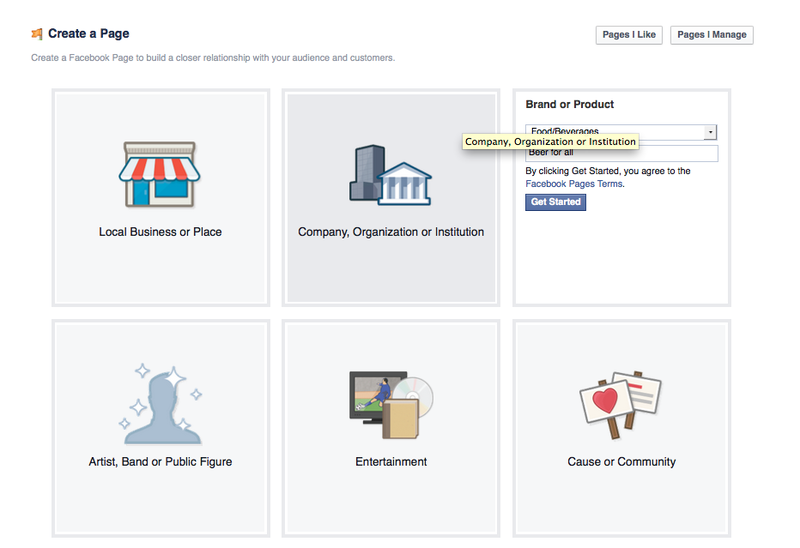 When creating a Facebook Page, an important step is determining the category of the Page. Choose an appropriate category that best describes the nature of your business and will help people find your Page. The category name is displayed on your Page, so it’s one of the first things a user sees when they visit your brand on Facebook. When creating a strategy for your Facebook Ads, make sure your goals are S.M.A.R.T. goals—specific, measurable, attainable, relevant, and time-bound. Creating S.M.A.R.T. goals for your Facebook Ads will help you achieve a better return on investment. For example, if you’re running a conference, your goal can be: acquire 100 registrants in two months. 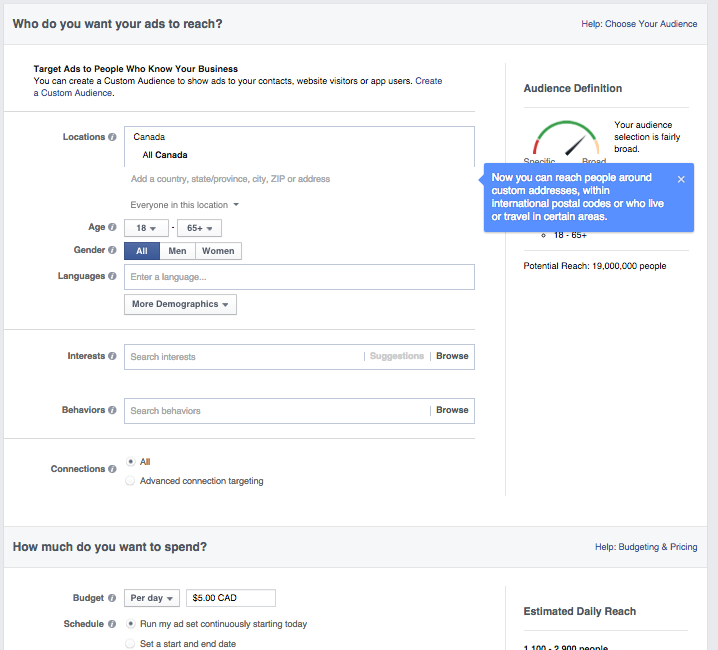 This goal will now guide your Facebook Ad strategy and help you choose the right type of ad. Now that you have created your Facebook Page and have goals for your ads, you can now go into the Facebook Ads manager and choose an objective for your ad. Learn more about specific campaign options and how they can help you meet your objectives in this video. Become a Facebook advertising pro with free social media training from Hootsuite Academy. This step is crucial in setting your Facebook ad up for success. You can target ads based on location, age, gender, language, interests, and behavior. 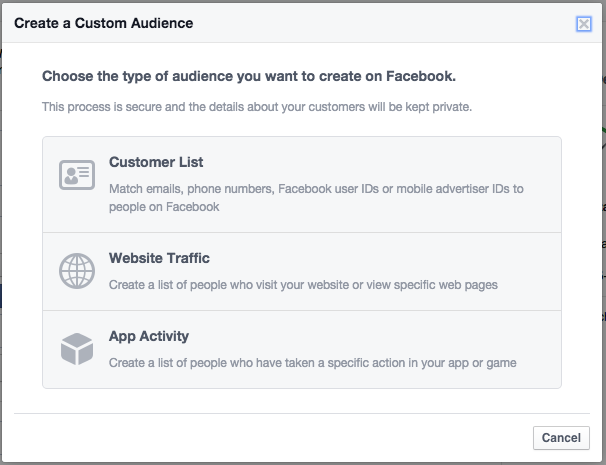 You can further customize by creating custom audiences to reach people who already know your business, or to remove them from your ad’s target audience so you can reach new people on Facebook. These custom audiences can be created through a customer list, website traffic, or app activity. Targeting the right audience will ensure you get the most out of your Facebook advertising dollars. For advanced audience research and targeting tactics, watch the video below. 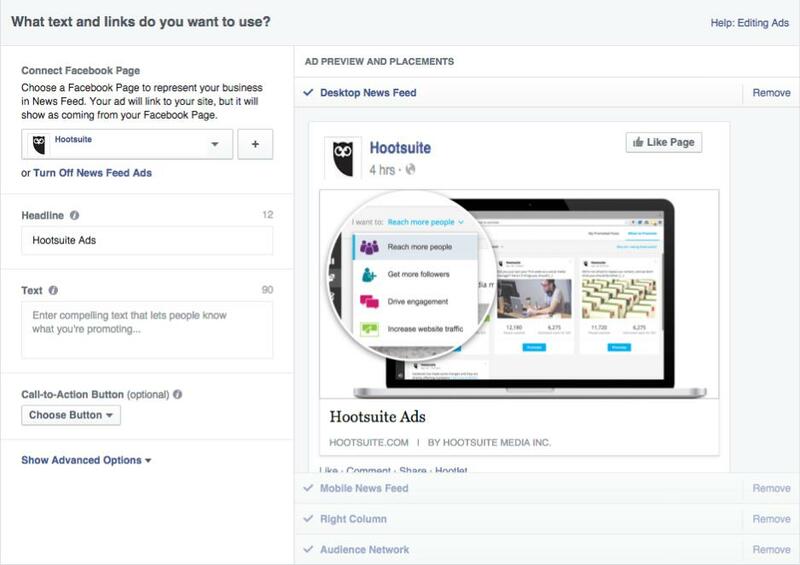 Learn more about Facebook advertising with free social media training from Hootsuite Academy. After you’re done choosing your target audience, you can then choose how much you want to spend on your ad. The ad budget you set is the maximum amount you want to spend. If you choose to have a daily budget, the amount you enter will be the maximum amount you’ll spend each day. If you do a lifetime budget, the amount you enter is the maximum you’ll spend during the lifetime of your ad. First, choose to bid for an objective: clicks or impressions. This will determine how you will pay and who your ad will be served to. For example: if you optimize for the Page like objective, you’ll be charged when your ad is shown to people who might be more inclined to like your Page. Once you’ve placed a bid for your objective, choose when you want your ad to run under ad scheduling. If you choose the lifetime budget route, you choose specific hours and days of the week when you want your ad to run. Choosing to run your ad on a schedule is the most efficient way to spend your ad budget wisely; this means that you are only serving your ad when your target audience is most likely on Facebook. For example, if you chose to target a specific region, you want to make sure you’re scheduling your ad when they are awake, this will allow you to make sure your ad will be seen by the people you want to target. The actual creation of the ad is the fun part of advertising on Facebook. Choose your images, headline, body text, as well as placement of the actual ad. You can have up to five images and the headline text can only be 25 characters. Keep in mind that because your headline is so short, your copy has to be intriguing enough for people to want to click on it. Along with the headline, there is also text that will accompany the post. This can only be 90 characters long, which means your copy needs to be clear and concise (think of it as a really good Tweet!). Lastly, you need to choose the placement of your Facebook Ad. Choose whether you want it on people’s desktop News Feed, mobile News Feed, right column, or audience network. Once you’re ready for your ad to be reviewed, click on the green button that says Place Order, located on the bottom right-hand corner. 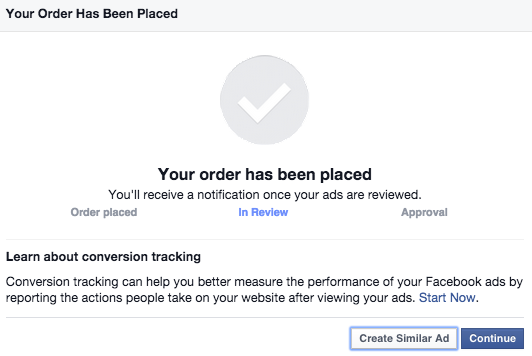 You’ll receive an email from Facebook once your ad has been reviewed and approved. Now that you have created your Facebook Ads, it’s important that you report on the successes (and failures) of your endeavors. To create a report on your Facebook Ads visit Facebook’s getting started site. Go to Ads Manager and click Reports in the navigation. You’ll automatically see data from the default report called General Metrics over the last 30 days for your active campaigns. Customize the metrics you see in your report and then click the blue Export button on the top-right column to download your report. And that’s it. 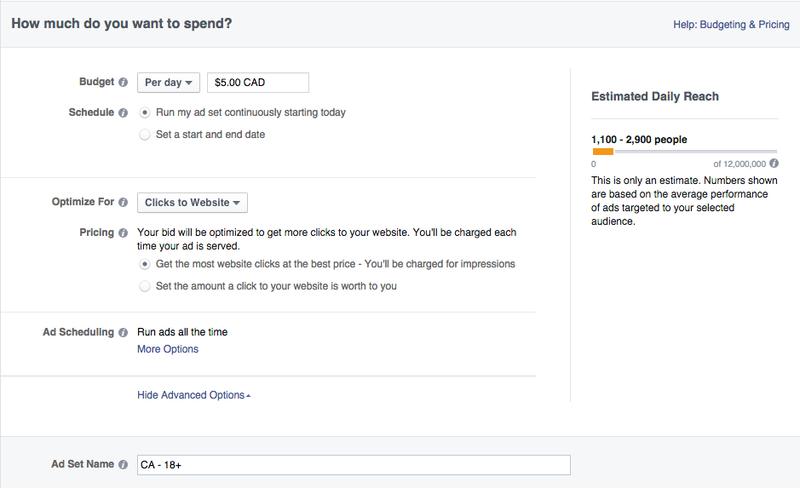 Now, if you want to really optimize your Facebook ads and get more out of your budget with less work, Hootsuite can help.